The most reliable way to speed up WordPress. 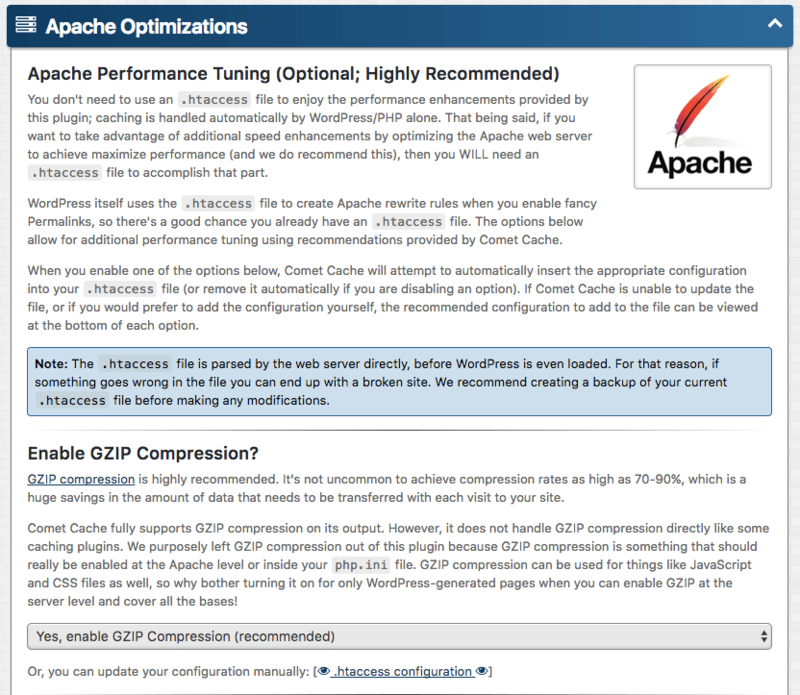 Page generation caching for all WordPress components. Posts, Pages, Custom Post Types, Categories, Tags, Links, Themes, Users, and more are monitored for changes and only the appropriate cache files are cleared. 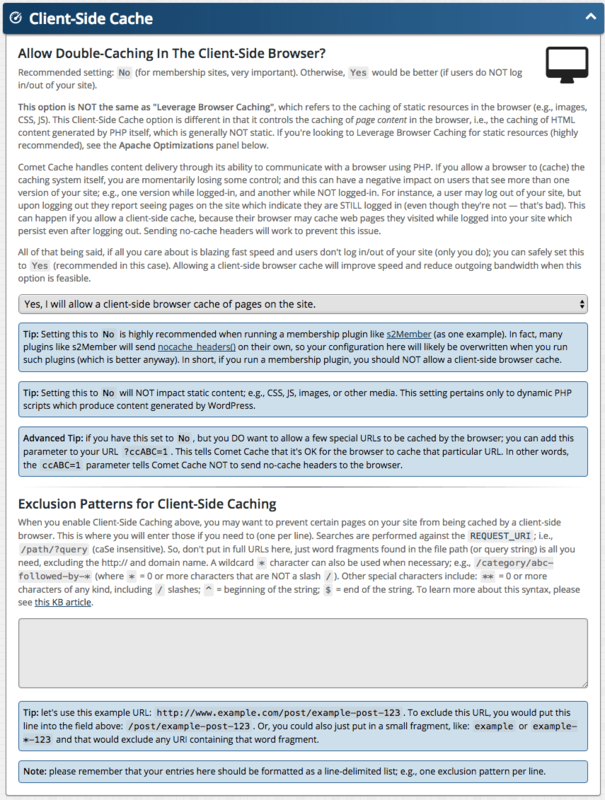 The ability to allow a double-cache, where the browser is allowed to cache the cache for extra speed. Why make feed readers wait? Comet Cache can speed up your content syndication feeds too. Cache 404 error requests to reduce the impact this has on your server; e.g. misbehaving bots/spiders. 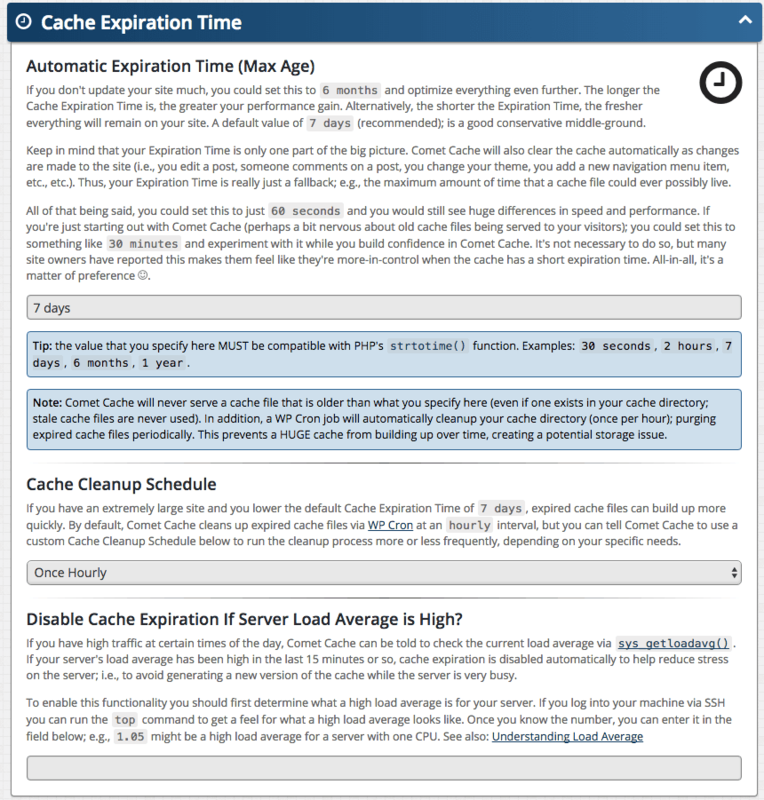 The ability to set an automatic expiration time for cache files. Your site remains fast on autopilot. 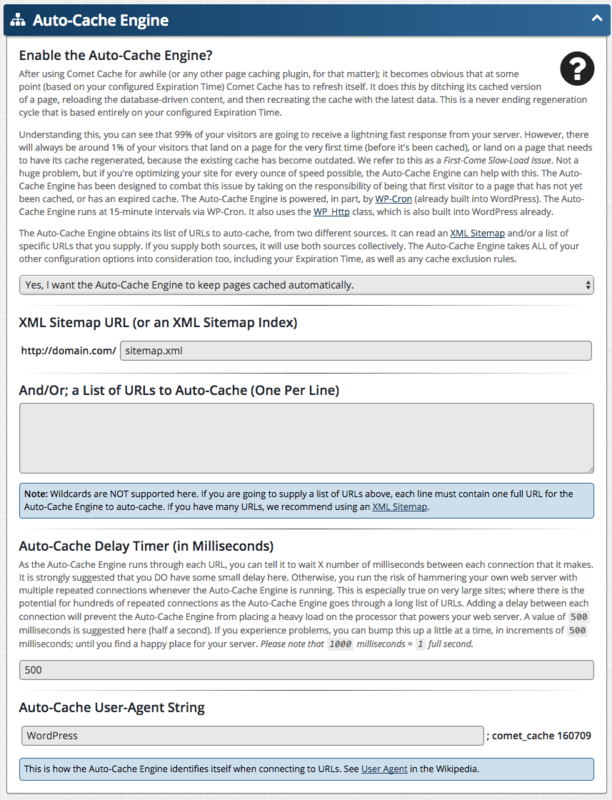 The ability to customize the cache for better compatibility with some themes/plugins. Exclude certain types of browsers (e.g. mobile devices) for special handling. Not necessary, but possible. 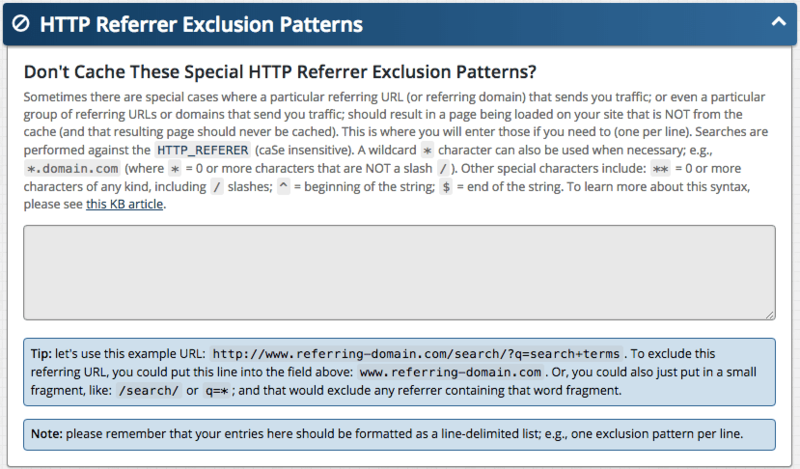 The ability to bypass the cache when visitors are referred to your site by certain domains. 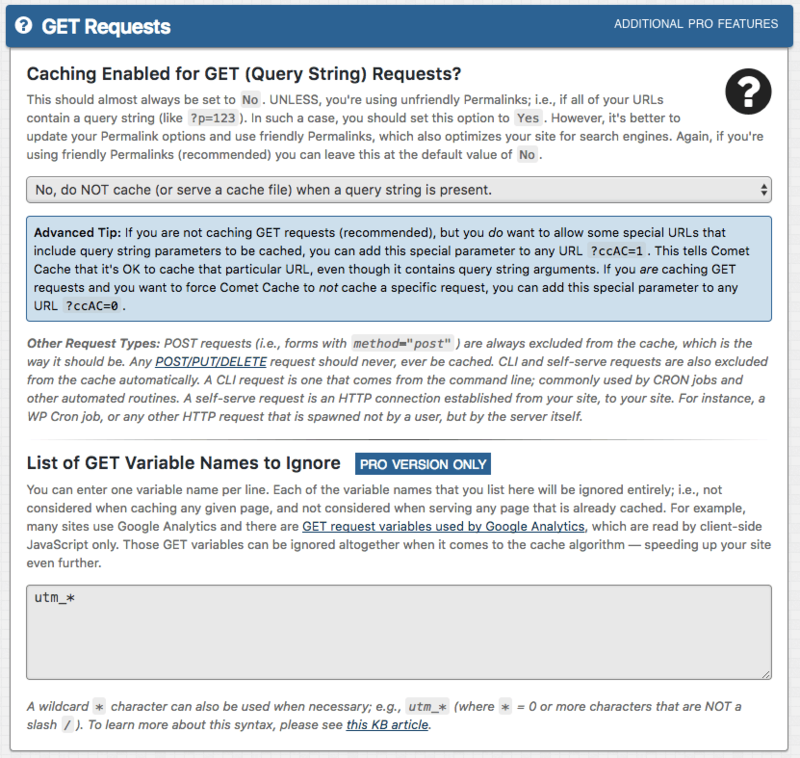 The ability to either cache, or ignore, URLs that contain query strings (GET Requests). Works w/ mod_deflate, PHP output compression, and other GZIP techniques. Supports installing, activating, deactivating, and deleting via WP-CLI. An Advanced Cache Plugin system for theme and plugin developers — extend Comet Cache™. The ability to enable debug notes in HTML "View Source" mode. 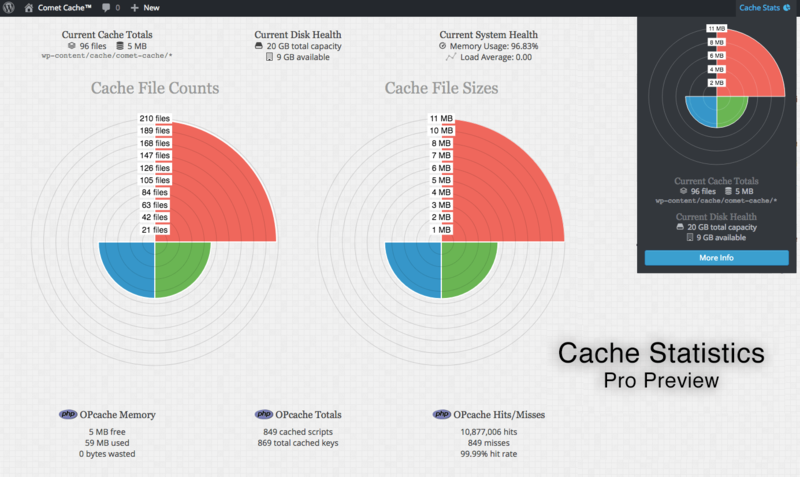 You can see what Comet Cache is doing. 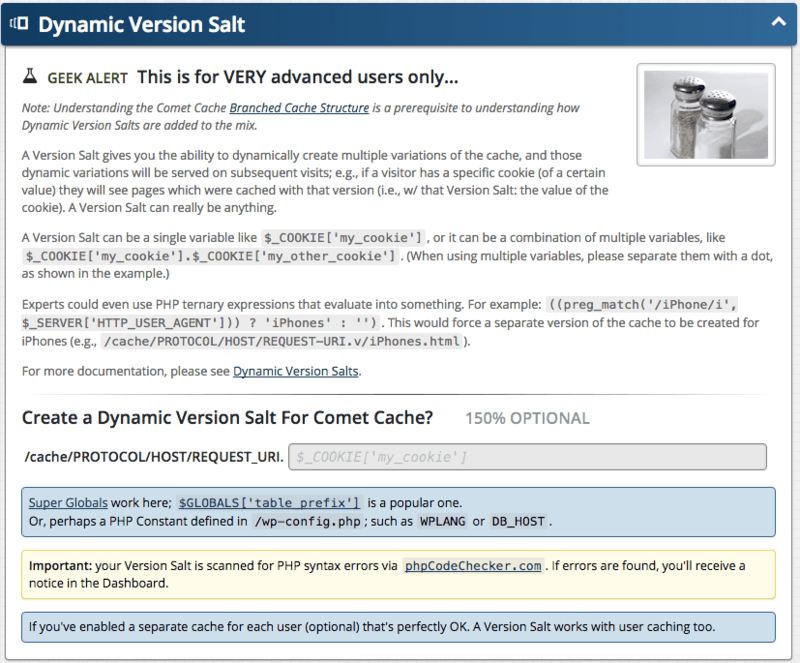 Comet Cache™ supports WordPress-approved translation support; POT file provided w/ source code. Our code is clean, commented (docBlocks), and contains tons of hooks. Easy for developers to extend. The ability to cache logged-in users too! VERY powerful, particularly for membership sites; e.g. s2Member®. Create multiple variations of the cache based any combination of configurable variables, including OS, device type, browser name, and browser version. Perfect for sites that use a separate mobile theme. 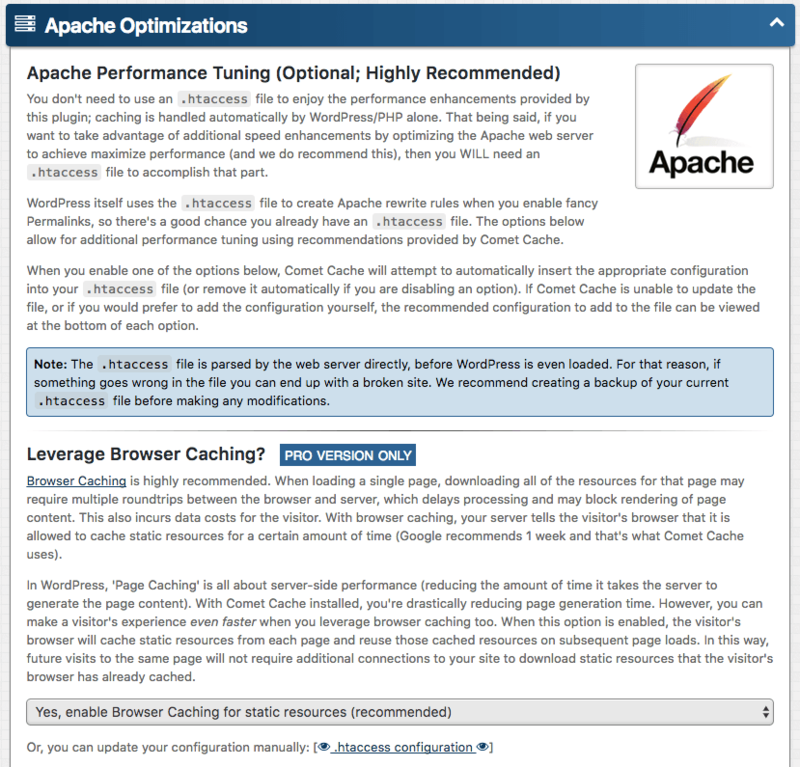 Avoid multiple roundtrips between the browser and server by leveraging browser caching with Apache​. 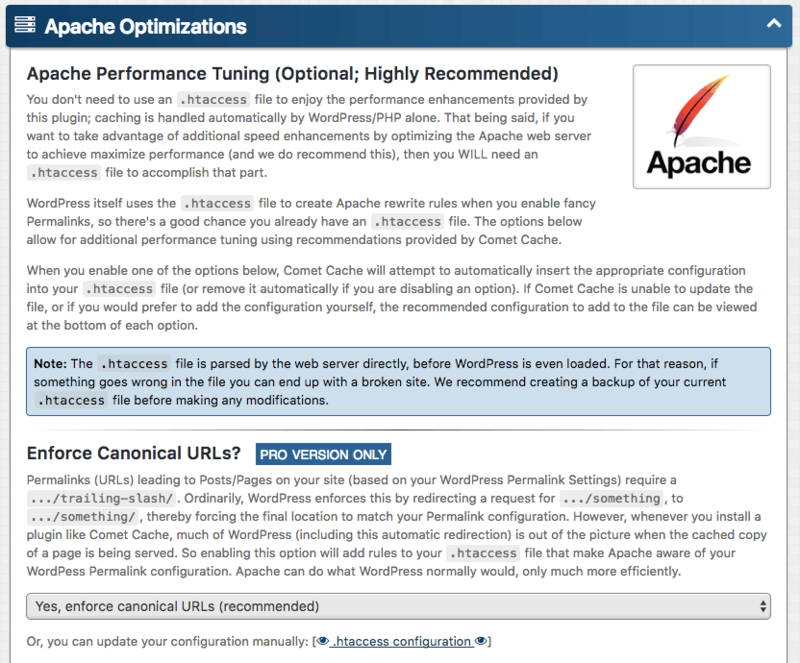 Force Apache to match your WordPress® Permalink configuration even when caching is enabled. A new improved "Clear Cache" button in the admin bar (along with an option to enable/disable this feature). 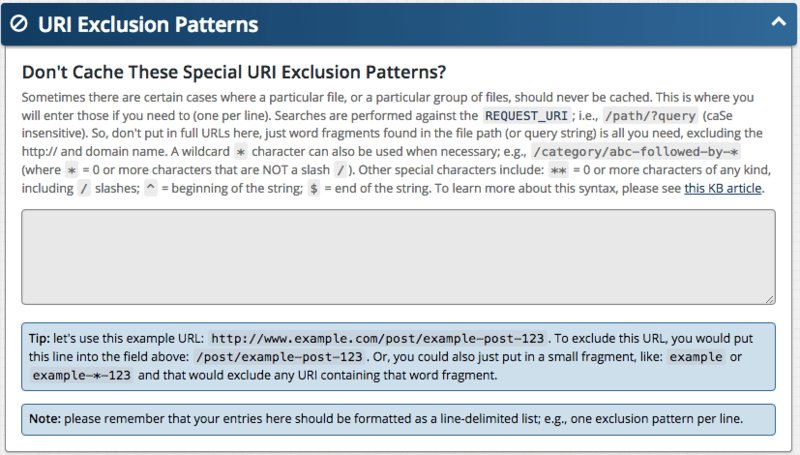 Specify a list of custom URLs whose cache files should always be cleared when the cache is cleared automatically. The ability to clear cache files generated by the s2Clean theme for WordPress (if installed). 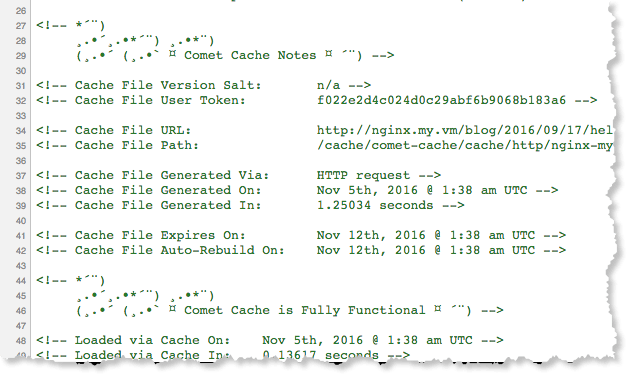 Import or export your Comet Cache configuration from one site to another. Huge time saver! The ability to generate multiple versions of the cache based on variables that you introduce. Give other users permission to clear the cache by specifying a list of Roles and/or Capabilities. Specify one or more custom routines with PHP to be processed when the cache is cleared manually. Manually clear the cache for a specific URL from anywhere on your site using Clear Specific URL button in the Admin Toolbar. Manually clear the cache for the current page from anywhere on your site using Clear Current URL button in the Admin Toolbar. Manually clear the PHP OPCache from anywhere on your site using a Clear PHP OPCache button in the Admin Toolbar. Auto-compress raw HTML code by removing extra chars & white space for smaller overall file size. The ability to automatically combine both local & external JS/CSS resources into compressed cache files. Automatically primes the cache; avoiding the potential for a first come slow-to-load scenario. 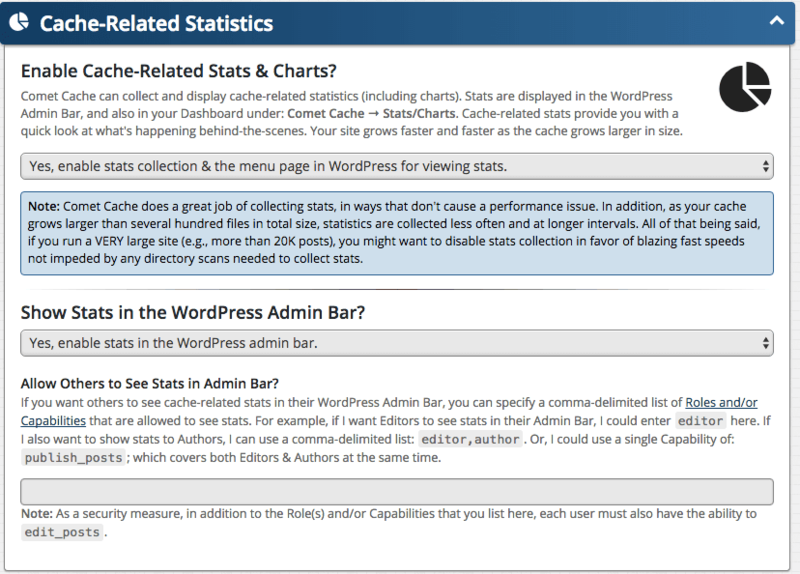 Analyze statistics about the page cache, HTML Compressor cache, PHP OPCache, and server health. Reduces latency associated w/ HTTP requests and server load. Supports CloudFront, MaxCDN and more. Serve static resources via CDN integration to users who are logged-in to your site. 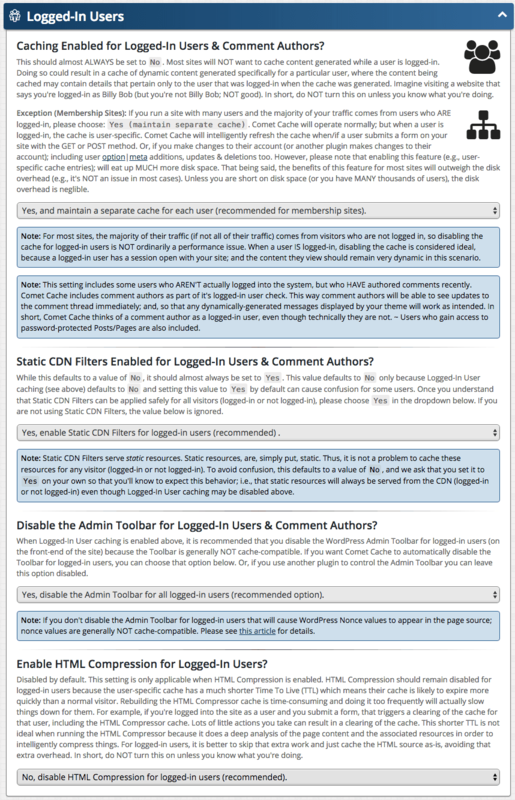 Serve static resources via CDN integration to comment authors (including anonymous commenters). Work around concurrency limits and make it possible for browsers to download more resources simultaneously! Manually clear the CDN cache from anywhere on your site using a Clear CDN Cache button in the Admin Toolbar. Avoid regenerating the cache while the server is very busy by specifying a maximum server load average. 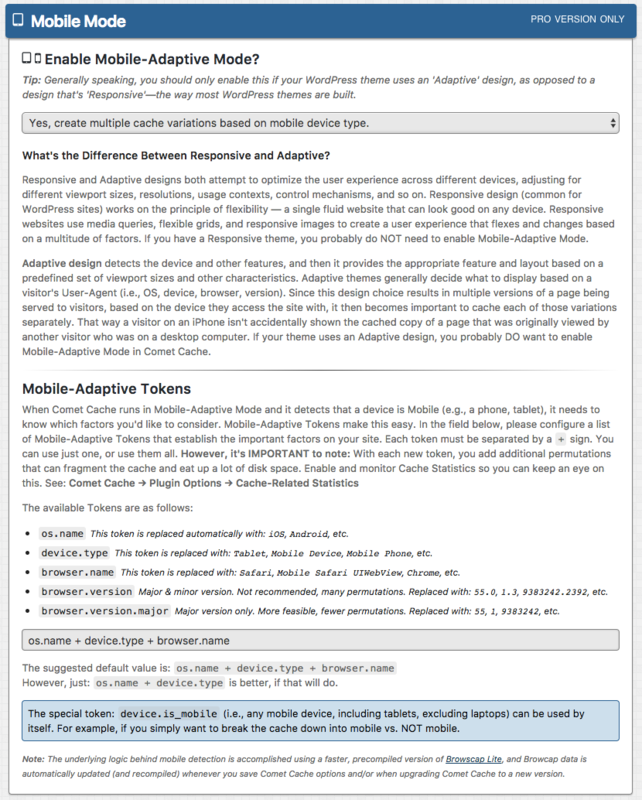 The ability to receive updates for the pro version (like any other WP plugin) from your Dashboard. Exclude specific child blogs from being cached in a Multisite Network. Supports domain mapping too! Comet Cache™ can be Network-enabled. Supports sub-directories, sub-domains, and domain mapping too. When you purchase Comet Cache Pro, you receive lifetime software updates and 3 years of support. 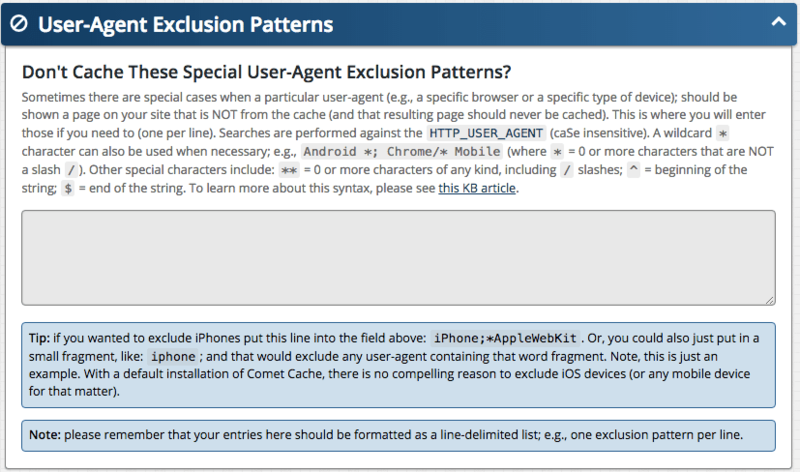 After three years, you may continue to use Comet Cache Pro for as long as you wish. However, if you need ongoing support, a small renewal fee of $9/year for a Single-Site or 3-Site license, or $29/year for an Unlimited-Site license is required. Please check your "My Account" page for details regarding the renewal of your account. Note: You may choose to renew, or not. Renewals do not occur automatically. Single-Site License: This provides support for one instance of Comet Cache Pro. Perfect for site owners with one domain name. Loaded with all Pro features at an affordable rate. It's a popular choice for many. Multisite Networks: Please note that if you run a WordPress® Multisite Network with Comet Cache Pro active on multiple child blogs or sub-sites within your Network (regardless of whether you use sub-domains or sub-directories), this will always require our Unlimited-Site License. This is because Comet Cache Pro runs as a separate instance on each child blog or sub-site in the Network. To clarify, a Single-Site License does NOT provide support for multiple child blogs or sub-sites, even if they do run within a single Multisite Network installation of WordPress®. A Single-Site License is valid for one instance only. 3-Site License: This provides support for three (3) instances of Comet Cache Pro. Perfect for site owners with up to three domain names. Loaded with all Pro features at an affordable rate. It's our most popular choice. If you're a developer: Your clients will need to purchase their own Single-Site and/or Unlimited-Site License, or you can purchase a Developer License that will cover their sites. The Single-Site and Unlimited-Site licenses do not support Comet Cache Pro instances on domains that you do not own and operate yourself—a Developer License is required to cover sites that you do not own. We invite all developers to join our affiliate program and refer their clients to us. 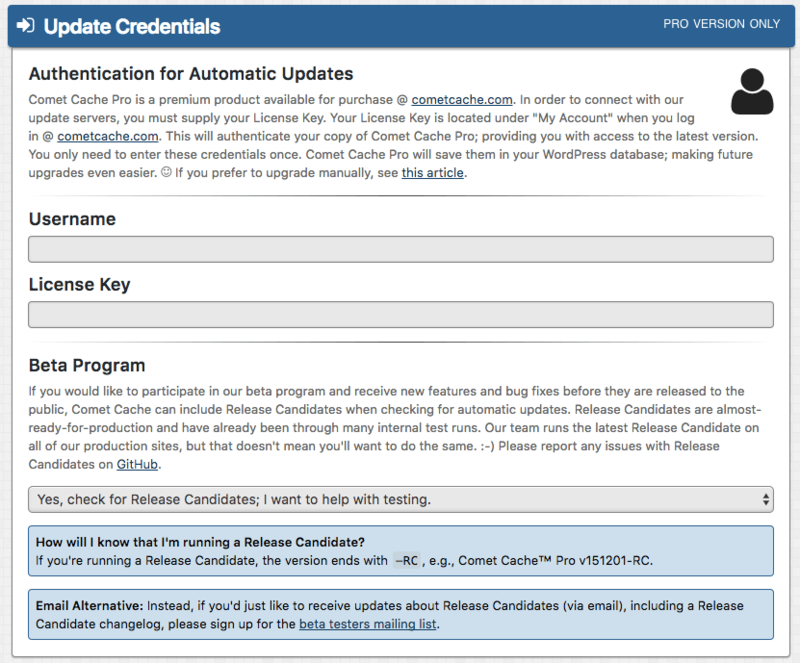 Your clients may purchase Comet Cache Pro on their own — you receive a commission. This also gives your clients access to future releases through an account they'll acquire at our website. 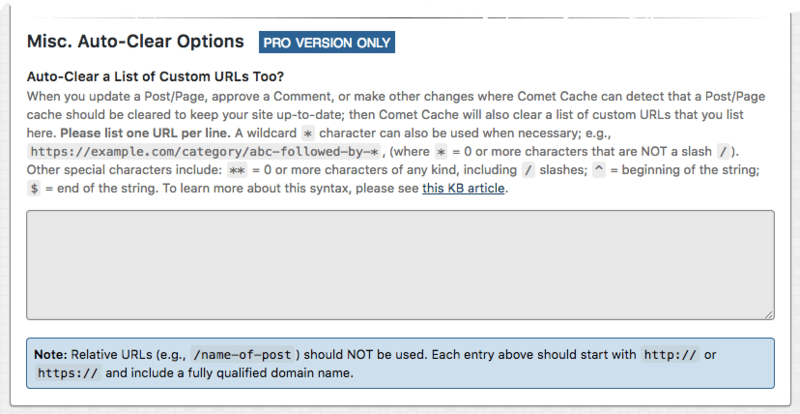 It's the approach we suggest for all developers working w/ clients needing Comet Cache Pro, but if you're managing your clients' sites you can use a Developer License to cover that scenario. We're committed to building the best software out there and we stand by our work. If Comet Cache Pro does not perform as advertised, we will refund your money within 14 days from the date of purchase. Absolutely no refunds will be given after 14 days from the original purchase. Once we issue a refund, your account will be downgraded and you will no longer have access to Comet Cache Pro. If Comet Cache Pro does not make your website faster, or if you have an issue with Comet Cache Pro that we cannot resolve, we will refund your money within 14 days from the date of purchase. To receive a refund for a technical issue, you should contact us with before/after comparison reports using Pingdom Tools to demonstrate that Comet Cache Pro did not make your website faster. All refunds require that you open a support ticket. Refunds do not apply to any renewal fees for ongoing access to support. Purchasing Comet Cache Pro indicates that you agree to the terms of the Refund Policy. Click Here to Speed Up YOUR Site!